Home › Comic › Have you seen Hans? It’s no big secret that Hans is a rather large chicken that likes to eat German sausages. But I bet even the largest chicken ever recorded wouldn’t weigh enough to compress the landing gear of a Cessna 172. 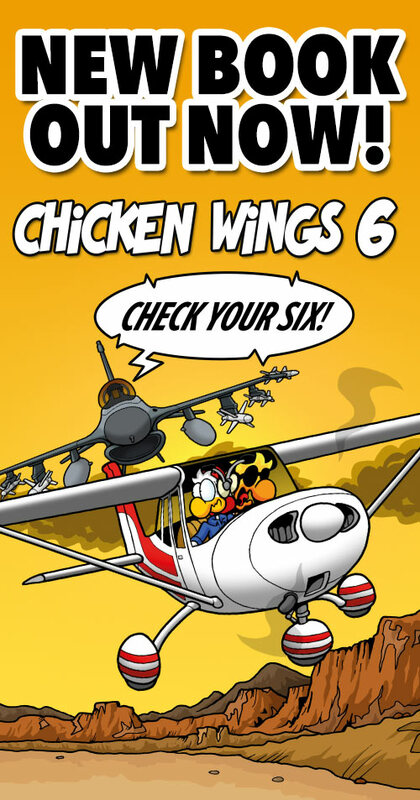 This is another “classic” comic from the very early days of Chicken Wings. In the very beginning of the series we have had it in our mind that Hans is from Germany, loves his beer and sausage, and has a very thick accent. Of course it is hard to portray an accent with a few speech bubbles of a comic. We tried touching on it with a few things they say but it just doesn’t “come out” the way it sounds in our heads. Should we ever go animated, there will be accents for Hans AND Julio for sure. Some of you may have noticed my absence in these blogs. This fire season has been crazy with more acres burned already than all of last year and we have all hands on deck. All of our machines have been called out and I have been on the road non-stop since the beginning of June. It’s hard to run Chicken Wings from the road especially when you’re sitting in a field without internet and your lovely helper has been called to a fire as well. I apologize for any delays getting your orders out as well. Things should calm down a bit in a month or so we are hoping. The lateral load limit is exceeded. In sunny California we currently have a monster. Nearly 100,000 acres and only 15% containment after five days. The smoke has been almost thick enough to practice instrument approaches in actual conditions. I hope your fire season goes better. The drawing reminds me of an advert for bottled water, perhaps Evian; and the car was a Citroen 2cv or such, with a thin lady driving and an, err, less thin lady in the right-hand seat. “Guess which of the two drinks (our water)”? NB intense helo flying, in Europe? Plenty of forests on fire in Italy, Portugal, … but apparently California gets its part, too? @Speed6: yes, the CX and related designs had the famous hydropneumatic suspension that began in the ID and DS models, and was even used (under due license) by Rolls Royce. My story was about the 2CV or perhaps its derivative Dyane, and their “frotteur” and “batteur” suspension. Hans being German has been pretty clear all along in my mind. I’m assuming Julio would have a Spanish accent? It’s been described much less clearly, but based on his name I’ve always assumed he’s Hispanic or Latino, despite him being drawn white while most of the others are yellow. Likewise, I’ve always imagined that Nobu is Asian based on his eyes. But what does ethnicity mean to chickens? Would make more sense to have them be different breeds of chicken! @Jan: A suoerb site about the 2CV. Thanks!!! Great. Now I want to see a character who is a pheasant. A turkey might even be fun.